Police arrested 127 demonstrators last weekend. Police arrested 141 people at a protest against the Dakota Access Pipeline in North Dakota today as officers attempted to disperse the crowd, authorities said. Officers also used pepper spray against protesters who police said were throwing things at them and refusing to comply with law enforcement's orders. There were two incidents of shots fired late this afternoon and evening, according to authorities. One occurred along Highway 1806 near what is known as the “backwater bridge” north of the main camp -- one person is in custody. A protester along the frontline on Highway 1806 also fired three rounds near officers. No one was injured and the protester was taken into custody. Three protesters had used devices to attach themselves to objects, presumably so they could not be moved from the site by officers, a press release from the Morton County public information officer said. But the chairman of the Standing Rock Sioux Tribe said law enforcement was continuing to overreact to the demonstrations against the pipeline project on what the protesters consider to be tribal land. "Militarized law enforcement agencies moved in on water protectors with tanks and riot gear today," tribe Chairman Dave Archambault II said. "We have repeatedly seen a disproportionate response from law enforcement to water protectors’ nonviolent exercise of their constitutional rights. Today we have witnessed people praying in peace, yet attacked with pepper spray, rubber bullets, sound and concussion cannons." Archambault called on the federal Department of Justice to "send overseers immediately to ensure the protection of First Amendment rights and the safety of thousands here at Standing Rock." The tribal leader also asked that protesters "remain in peace and prayer. Any act of violence hurts our cause and is not welcome here." An estimated 250 demonstrators against the pipeline are at the site of private land, and about 80 others at another location nearby, the press release said. Thousands are camped out at Standing Rock Reservation in protest against the four-state crude oil pipeline project. Earlier in the day, heavily armed police officers clad in riot gear and equipped with SWAT trucks closed in on the demonstrators, demanding that they remove the blockade they had set up on the highway. 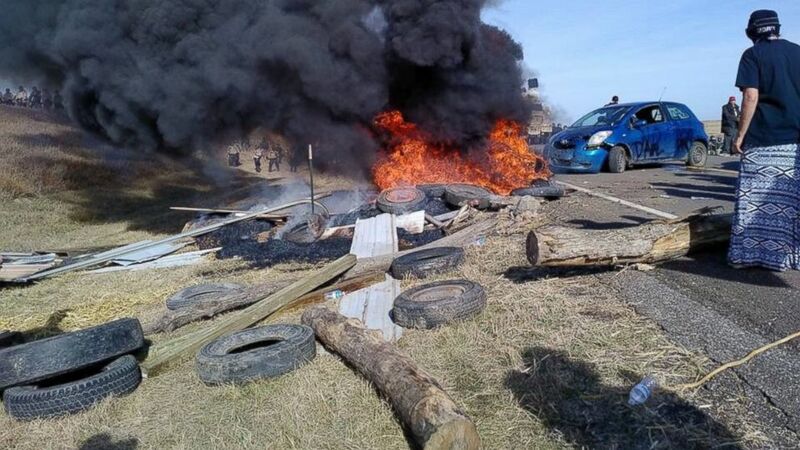 The Morton County Sheriff's Department told ABC News today that protesters had also set tires on fire. A witness told ABC News today that law enforcement used sound cannons to disperse the demonstrators who had gathered. Donnell Hushka, the public information officer for the Morton County Sheriff's Department, told ABC News law enforcement did utilize "an LRAD, which gives a long range high pitched noise, to clear and disperse crowds." Today's conflict comes after police arrested more than 120 demonstrators last weekend, bringing the total number of protest-related arrests since mid-August to 386 people, according to the Morton County Sheriff's Department. (Sam Shawcross/Twitter) Tensions heightened between law enforcement and protesters over the Dakota Access Pipeline near the Standing Rock Sioux Tribe's reservation in North Dakota on Oct. 27, 2016. Protesters said heavily armed law enforcement officers unleashed pepper spray on a crowd of unarmed demonstrators on Saturday, while officials say the protesters were illegally trespassing and the pepper spray was deployed as a preventative measure. Demonstrators justified their presence by citing an 1851 Treaty that they say specifies that the land was designated for Native American Tribes. 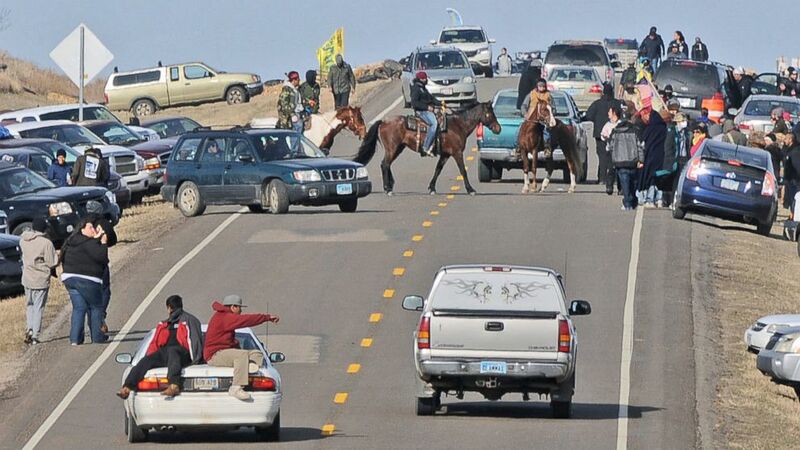 The Morton County Sheriff's Department released a statement today saying "authorities began taking steps to remove the illegal roadblocks and protesters trespassing on private property near Highway 1806." 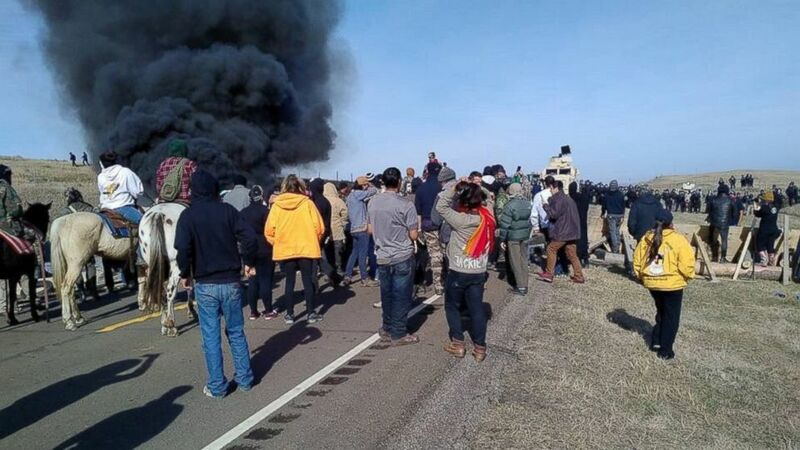 Wyn Hornbuckle, the deputy director of public affairs for the U.S. Department of Justice, told ABC News in a statement that the department was "taking the situation in North Dakota seriously." Hornbuckle added that department employees have "been in communications with state and local law enforcement officials, as well as tribal representatives and protesters, to facilitate communication, defuse tensions, support peaceful protests, and maintain public safety. The department has also offered technical assistance and community policing resources to local law enforcement in support of these goals." Danny Grassrope, 24, told ABC News Saturday that he was arrested at the protest site and witnessed police officers spraying protesters while they were praying. "This weekend we went to go demonstrate with peaceful action. We went to go pray," Grassrope said. "Then while we were praying, the cops came and told us we couldn't be there. We were just standing there and then this police officer came and opened up with some pepper spray. We weren't antagonizing them or anything, we were just praying." Grassrope said he was arrested and charged with criminal trespassing and engaging in a riot, and was held for six hours before a group of friends paid his bail. Grassrope has not yet entered a plea. "I don't understand why it was a riot, the police were in riot gear we were just praying," Grassrope added. Grassrope said he has been living on the Standing Rock Sioux Tribe reservation for the past five years. His mother is Standing Rock Sioux and his father is Lower Brule Sioux. (Tom Stromme/The Bismarck Tribune via AP) People protesting the Dakota Access Pipeline gather along North Dakota Highway 1806 in Morton County at the site of a new camp that was being put together, Oct. 24, 2016, in Cannonball, North Dakota. Hushka, the public information officer for the Morton County Sheriff's Office, confirmed to ABC News that protesters including Grassrope had been arrested and charged with engaging in a riot and criminal trespassing, both class B misdemeanors. Hushka said there were about 300 protesters who trespassed onto private property, but the sheriff’s office was not disclosing the number of law enforcement that were at the scene. "Protesters attempted to breach the police line and did not follow the officers’ instructions," Hushka said. "Officers did utilize pepper spray, to protect police officers." "There are no issues if they want to protest peacefully and legally, but on numerous occasions they have engaged in illegal action by trespassing on private property,” Hushka added. 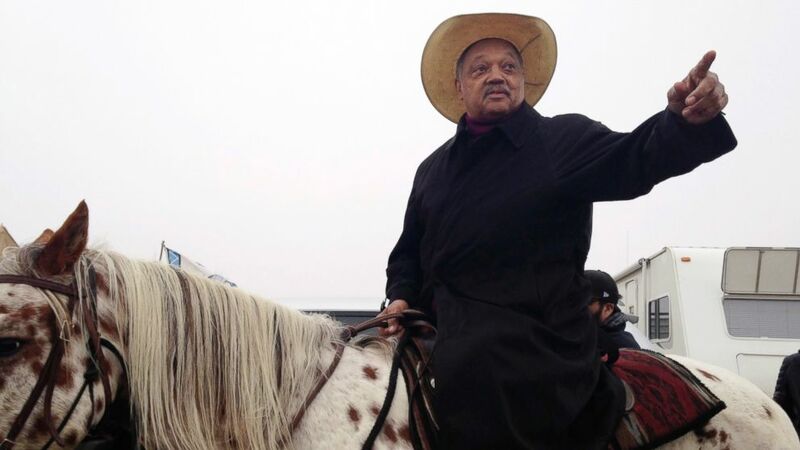 (James MacPherson/AP Photo) Civil rights activist Jesse Jackson sits atop a horse, Oct. 26, 2016, while visiting the protest camp against the Dakota Access oil pipeline outside Cannon Ball, North Dakota. Jackson said he came "to pray together, protest together and if necessary, go to jail together."